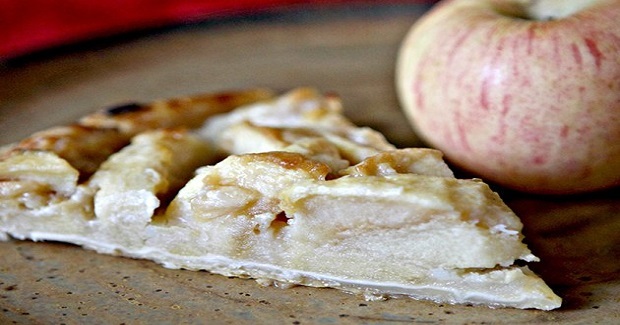 Grandma’s Apple Pie Recipe - Gutom Na! Posted on Wednesday, June 8th, 2016 at 5:13 pm. Preheat your oven to 220 degrees C. In a saucepan, melt the butter and stir in the flour. Once a paste forms, add the water and sugars. Bring this to a boil, and reduce to a simmer. Place the bottom crust in your pie pan, and poke a few holes in it with a fork. Fill the pan with apples. Then cover with another layer of crust, this time laying it on lattice-work style. Slowly pour the sugar and butter liquid over the crust—the liquid should fall into the lattice-work crust’s holes. Place the pie pan on a cookie sheet to catch the liquid that will bubble over the edges of the crust while being baked. Bake the pie in the preheated oven for 15 minutes, then lower the temperature to 175 degrees C. Bake for another 40 minutes, then remove from oven. Serve slices solo (while warm) or with your choice of topper.